CGI (former Logica) provided a half day workshop / get-together for some Finnair and CGI staff in Finnair’s premises on Friday 30 September. They had invited their own service designer (UX Lead) Markku Myllylahti to explain about service design and some projects where they had used service innovation and UX design methods. In presentation itself Markku told that user experience design is started by defining user, goals and context and need to know who, where and when. UX design in digital concept consists of visual design, user interface design including navigation and how all the information is presented. He emphasized that visual beauty isn’t it all but how the user interface has to work in logical way, too. Also he said that user needs need to be identified but not all ideas or requirements are always economically feasible. He mentioned Jesse James Garret as good author regarding UX design. Regarding service design Markku explained that it’s about how the individual feels how the service experience was. According to him it’s about finding out the different scenarios and what is happening with users and what kind of environment. Using collected information to create new concepts and solutions. 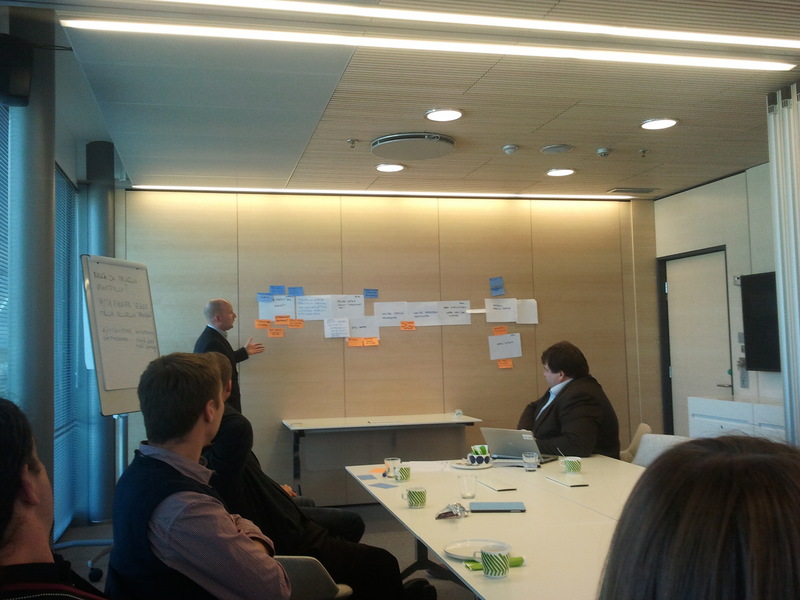 Markku said that service design enables cost savings by improving the user experience. It makes use of time more efficient and initially leads to better product quality and company brand value. Some CGI’s projects involving UX design were also presented. Markku Myllylahti facilitating team work activities. Case: oneworld.com – updating existing website to responsive and compatible to all kinds of terminals and screens. According to Markku oneworld airline alliance approached them by telling their website and platform needed updating. CGI UX specialists held workshops with oneworld and introduced them the concept of responsive design. CGI explained how it makes easier to users to browse the website with different kind of terminals (instead of separate mobile site that they had before). Website was also moved to use cloud services which reduced costs. Also site management was improved by enabling quicker updates to the site without involvement of external party. This half day workshop was fun and informative. It was great that Markku activated participants with team work activities using design thinking tools such as Journey Mapping between each presentation.